In a large bowl, stir together the milk, cream, sugar, salt, vanilla extract and peppermint extract until the sugar has dissolved. Color to your liking with the green food coloring. 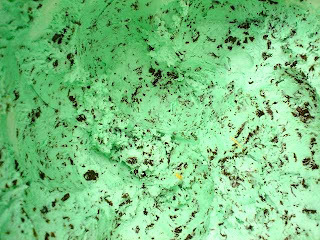 Pour the mixture into an ice cream maker, and freeze according to the manufacturer’s instructions. After about 10 minutes into the freezing, add the chocolate chips. After the ice cream has thickened; about 30 minutes later, spoon into a container, and freeze for 2 hours. my favorite flavor! I need to find an ice cream maker so I can try this one out!